This is the first in a series of posts about solving common problems with puppies. Follow the whole series by subscribing to our blog at the bottom of the page. At Pauley’s Pups in Ashland, Virginia, we love cute puppies more than anything else in the world. But when they chew up our new pair of sneakers or our expensive electronics, we’re less than pleased. Puppies naturally chew things to investigate them, just like babies put objects in their mouth as a way to explore the mysteries surrounding them. As puppies go through the somewhat uncomfortable process of teething for about six months, chewing helps make their gums feel better and is a normal issue that dog owners should expect to deal with. Your goal as the owner or caretaker of a young puppy is to direct their chewing habits and choices, so they don’t destroy beloved household items. The more you guide them as a puppy, the better behaved they’ll be when they grow up. As with most behavior, it’s much harder to change a full grown dog than it is a malleable puppy. First, hide items you don’t want in your puppy’s mouth—such as the heirloom pillow your grandma gave you—on high shelves or inside a closet or cabinet. They can’t chew what they can’t access. Next, offer your puppy specific dog chew toys that look nothing like typical household items. In other words, don’t give them your old sock rolled in a ball. You have to teach them what to chew and what not to chew. Other proven ways to deter puppies from destructive chewing habits include using a spray “taste deterrent” on items to make them unappealing to the dog’s sense of smell and taste or interrupting their chewing with a loud noise. If your puppy is chewing on something you don’t want them chewing on, distract them with a loud noise to get their attention. Make a point of placing an appropriate chew toy near the puppy’s mouth and encourage him or her to chew on that, lavishing praise so your pet knows you happily approve. If you discover a chewed up object after the fact, there’s really nothing you can do. Your dog won’t understand what you’re trying to say, and punishment will be unproductive. Finally, treats go a long way in convincing a puppy to do what you want them to do. They’ll stop chewing on items if you offer them a treat in exchange for the item in their mouth. You can add the command “give” as a cue to release the object. 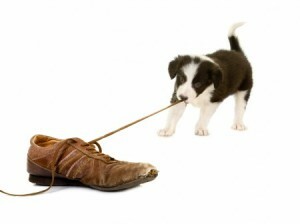 Your puppy will learn, over time, to chew treats rather than household items. For more solutions to your potential “Puppy Problems”, stick to the Pauley’s Pups blog by subscribing below. If you’re interested in small breed puppies for sale in the Ashland, Virginia area, visit our website and check out our adorable selection.